Church Robber Gets 40 Years in Plea Bargain, LIVINGSTON, April 20, 2013 - The man who burglarized a church was caught reached a plea bargain in Kaycee Jones' 411th District Court on Friday. Brandon Hook, 24, of San Jacinto County, burglarized the First Apostolic Church in Goodrich on October 24, 2012. While he was in the building a woman entered the church to clean. Hook forced her to lay on the floor, got her driver's license and told her he knew where she lived and that he would kill her and her family if she told anyone. Hook fled but the Polk County Sheriff's Office responded quickly and caught him sleeping in an abandoned building in San Jacinto County. Deputies recovered stolen items in the back of Hook's truck. Brandon Hook has a lengthy criminal history of theft and burglary dating back to 2006. Hook will have to serve 20 years before being eligible for parole. Given Hook's lengthy criminal history of theft and burglary, he likely would have gotten lengthier sentence had the case gone to trial. This story is listed chronologically below. Man Caught and Charged in Goodrich Church Robbery, SAN JACINTO COUNTY, October 25, 2012 - Detectives with the Polk County Sheriff's Office apprehended the man who allegedly robbed the First Apostolic Church in Goodrich one day earlier. Brandon Dwayne Hook, 26, of Coldspring was transported to and booked into Polk County Jail on the afternoon of October 25, 2012 and is being charged with aggravated robbery. At time of press, PolkCountyToday.com doesn't have the details on exactly how the suspect was caught. We will post details when we receive them from the Polk County Sheriff's Office. Sheriff patrol units at the First Apostolic Church of Goodrich. Armed Man Burglarizes Church, GOODRICH, October 24, 2012 - Shortly before 8 am on October 24, 2012 a call was placed to the Polk County Sheriff's Office to report a robbery in Goodrich. Deputies arrived to find that the suspect (a white male, bald, mustache and goatie) had fled. What happened is the worker arrived to find a burglar with a hand gun burlarizing their church. The burlglar fled in an older model white Chevy truck with paint that was peeling. The burglar headed south on US-59 into San Jacinto County. Soon, more deputies, and detectives from the Polk County Sheriff's Office arrived including Sheriff Ken Hammack. At around 10 am, Narcotics Detective, Chris Lima caught up with the suspect in his vehicle and at his residence in in San Jacinto County. Lima ordered the suspect to get out of his vehcile, but he refused. Lima radioed that the property from the Church was in the back of the suspect pickup. The suspect jumped out of the vehicle and fled into the nearby woods. Lima called for backup and was soon joined by Narcotics Detective, Vance Berry and other deputies from Polk County and law enforcement personnel from San Jacinto County. At time of press (2:30 pm), the suspect has not yet been apprehended, but a perimeter has been established surrounding the area as law enforcement try to locate the burglar. 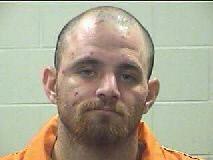 SUSPECT IDENTIFIED: Brandon Dwayne Hook, 24, of San Jacinto County. Hook was recently released from San Jacinto County Jail. There's now a warrant out for Hook's arrest out of Polk County for aggravated robbery. Hook is bald white male, about 6 ft tall with a medium build. If you or anyone you know is aware of Hook's whereabouts, please contact the Polk County Sheriff's Office. Detective Christi Allen at the scene. Sheriff Hammack assisted his personnel. Narcotics Detectives Vance Berry (left) and Christopher Lima also assisted. Lima (pictured at right) caught up with the suspect a short time later, but the suspect ran into nearby woods and is still at large. Mixi sniffs property adjacent to the church.